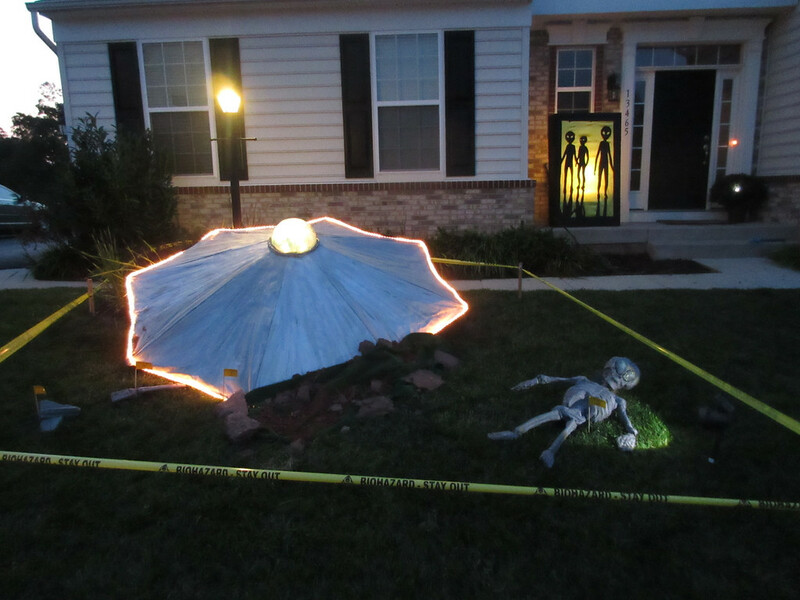 DIY Halloween Alien Crash Yard Decor Mama Say What?! | Mama Say What?! Halloween is my favorite holiday. I love creating costumes and festive decor. 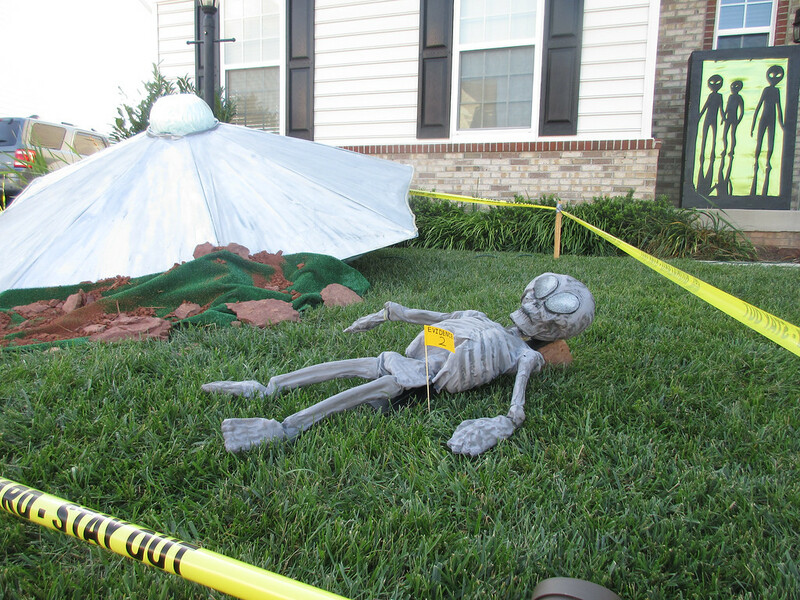 This year I wanted to do something different for our Halloween yard. Our neighborhood is full of mostly very young children so I didn’t want anything too scary but still keep the spooky Halloween vibe. 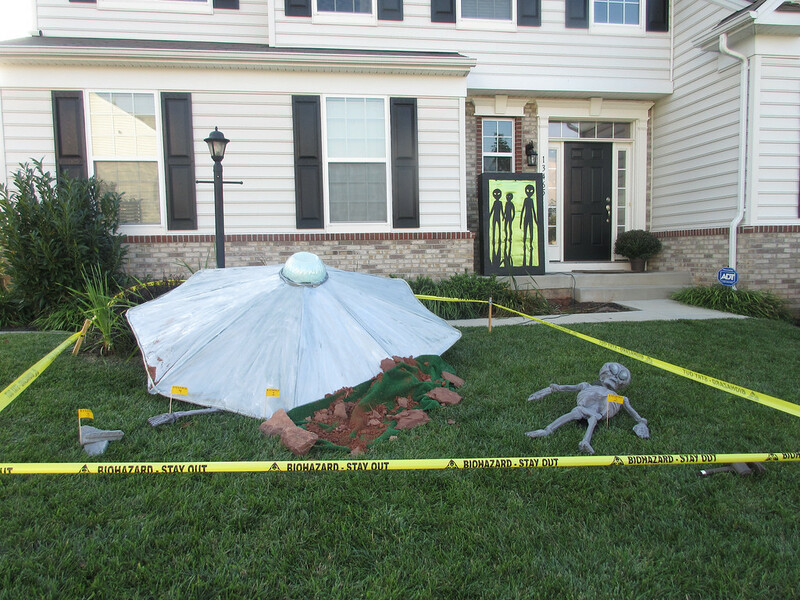 I decided it’d be fun to turn my yard into an alien crash site. It was pretty tricky coming up with how to create this look without spending too much and also making it weather-proof and easily stored during the rest of the year. Here’s how I did it. I used fishing line and a sturdy upholstery needle to sew the rope lights around the edge of the umbrella. The dome is a plastic party bowl upside down and lined with tissue paper. I punched a hole on either side of the bowl and used the fishing line to anchor it down then finished the edge with some duct tape. I threaded a small string of lights in side the bowl from underneath the umbrella and used outdoor extension cords to run the lights to my house. 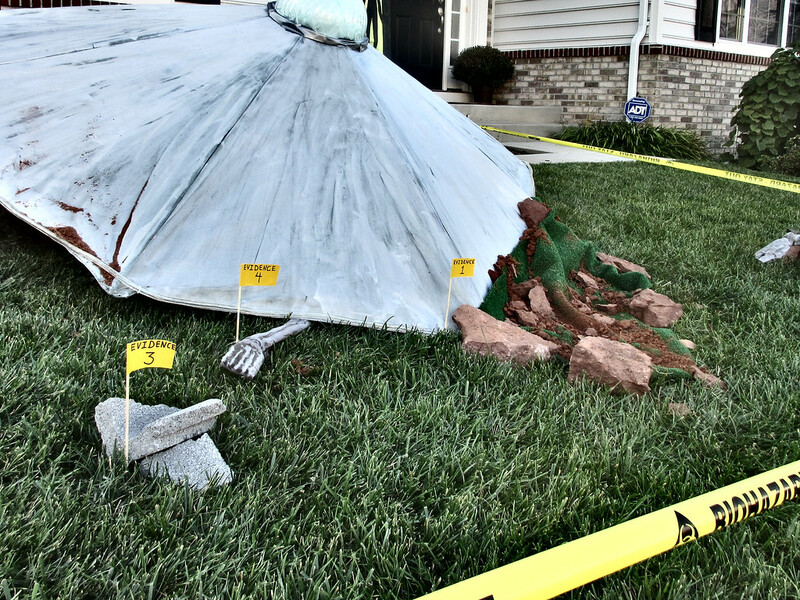 A small strip of AstroTurf scattered with dirt and rocks was used to make it look like it had crashed down into the ground. I wanted to buy a rubber alien doll to lay down as a casualty next to the ship, but I found them much too expensive to buy outright. I wanted to create one with paper mâché but couldn’t think of a reliable way to make it weather proof enough to be laying in the yard all month long, year after year. Luckily I had some old plastic skeletons from previous halloween decorations and they were starting to break apart. So I took them apart and rebuilt a more alien form with the parts. The legs and arms are only single bones instead the two a human would have. I used some plastic grocery bags bunched up then taped onto the top of skull with packing tape to make the larger, rounded out skull shape seen on typical aliens. Then I picked up some clearance fabric that was in an “alien skin color” and with a hot glue gun I covered the skeleton in it, being sure to get it pressed tightly into all the crevices of the bones, especially the teeth of The skull. After it was set I used a sponge brush dipped in some watered down black craft paint and brushed it lightly over the ridges to give it definition. I wanted reflective eyes so I got a sheet of glitter sliver foam and cut out the large eyes. They were glued down with the hot glue gun. 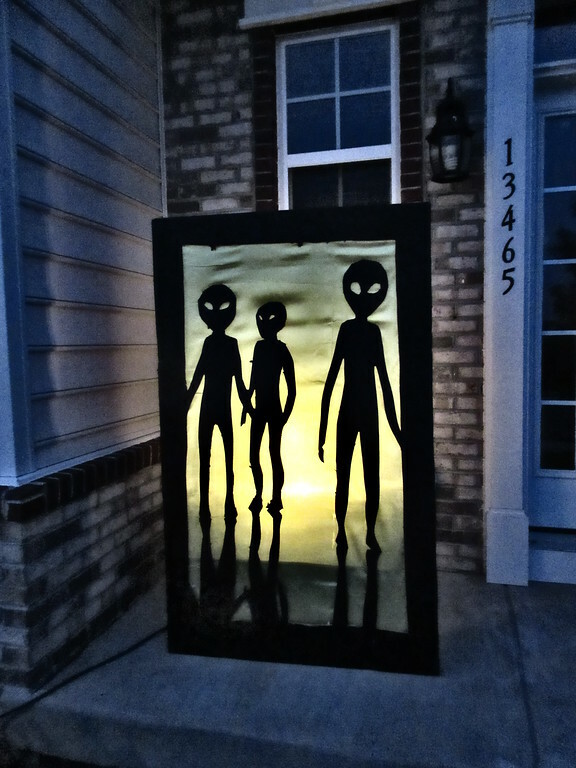 The finished alien was very light and we get some strong winds through our yard so I got a scrap piece of wood and painted it black and tied the alien to it with some fishing line. Now it would lay down without being blown around the yard. I used the same fabric and paint technique on one more skeleton leg that I could have peaking out from under the crashed ship. I wanted it to look like the crash site was being officially investigated so I got a roll of bio-hazard tape and tied it around the perimeter of the scene with some wooden stakes in the ground. For my evidence tags I used wooden kabob skewers with a strip of yellow duct taped wrapped around the top. Then a sharpie was enough to permanently write the words and numbers on the duct tape. I pushed the skewers into the ground next to the different parts of the scene. I had recently saved a large cardboard box for my son to color on. I decided to use this as an added decor element. With an x-acto knife I cut out a doorway shape with alien silhouettes emerging from the middle. Then I painted the entire thing black. I lined the inside with green fabric, using hot glue to secure it to the cardboard. With a spotlight positioned behind, shining through the fabric, it appears the aliens are standing in an eery illuminated doorway. This is the one element that is not weatherproof so I do bring it inside when it’s supposed to rain. I’m very happy with how the entire look came together. We can’t wait for Halloween night so we can see all the trick-or-treaters enjoy the creepy scene we created! I’ll be sure to put some eery alien music on a speaker to complete the mood. Added by Laura K. on October 22, 2014.